Tortola is known more for sailing than surfing... for the most part the trade winds blow out of the east, our waters are (fairly) protected by an archipelago of beautiful islands, and waves on the north shore are mediocre at best most of the time. 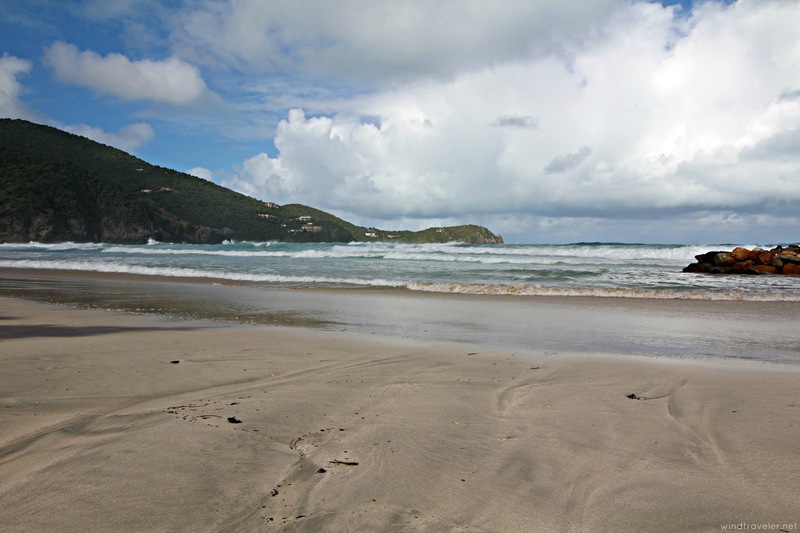 It's why our beaches are so popular and perfect; they are calm and serene... perfect for swimming and lounging. Great for kids to play and splash. Perfect for paddle boarding and just kicking back... Until a north swell, rolls in, that is. 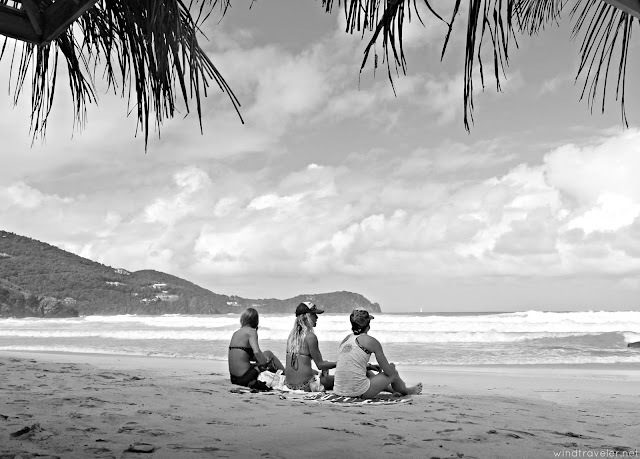 Then Tortola becomes a surfers paradise and people come from around the world to surf here. When I asked my friend Aaron (a big wave surfer who live's on Hawaii's North Shore), if it really got that good here he replied, "Oh Brittany ... when it goes off - it goes OFF. It's a world-class wave". So when there was talk that a North swell would be rolling in (they always know when it's coming due to weather patterns up north) - the biggest in eight years - I started getting excited. Partly because it's something different (yay, waves! ), and partly because I am both in love with and awed by the power of the ocean (remember my review of The Wave?). If you have never had the pleasure of standing next to a beach where six to ten foot waves are crashing, let me tell you, it's incredible. The fury with which the sea hurtles itself toward land is one of the most humbling experiences to behold. The sound it makes when it crashes is almost deafening, you actually need to yell a bit to speak over it, and to see that same wave gently recede away back to the ocean...well, these magnificently and perfectly chaotic natural occurrences serve as a reminder about our place in this world. Quieting my mind is not something that comes naturally to me, but I am in my most meditative state when watching waves crash into the shore, one after another, after another... There is tremendous peace in the chaos of it all. I am always up for a little adventure with our girls and when my dear friend Meg asked if we wanted to go "wave sighting" - I jumped. I had been thinking the exact same thing when she messaged me. We all piled into my car, cameras and kids in tow, and embarked on a spontaneous 'round the island' wave-hunting adventure. We hit all the major bays on the North side, starting in Apple and finishing in Josiah's. The drive, despite a couple fussy kids from time to time and the crazy island drivers who give me heart palpitations at every corner, was spectacular. Every turn offered a new view and I must have said, "I love it here SO much!" ten times. To live in a visually spectacular place is important to me, and holy moly, do we live in a visually spectacular place. We stopped outside Bomba Shack and that's where we first saw the massive waves rolling in. The beaches had already all been closed because of this massive swell and the red "Do Not Swim" flags were flying in the stiff breeze. We drove along further and caught a glimpse of a "seaspraybow" - a rainbow created by the large amount of spray coming off the top of the waves glistening in the sunlight - the girls (expert rainbow spotters, in fact) were the first to see it from their view from the back seat. Pure beauty. 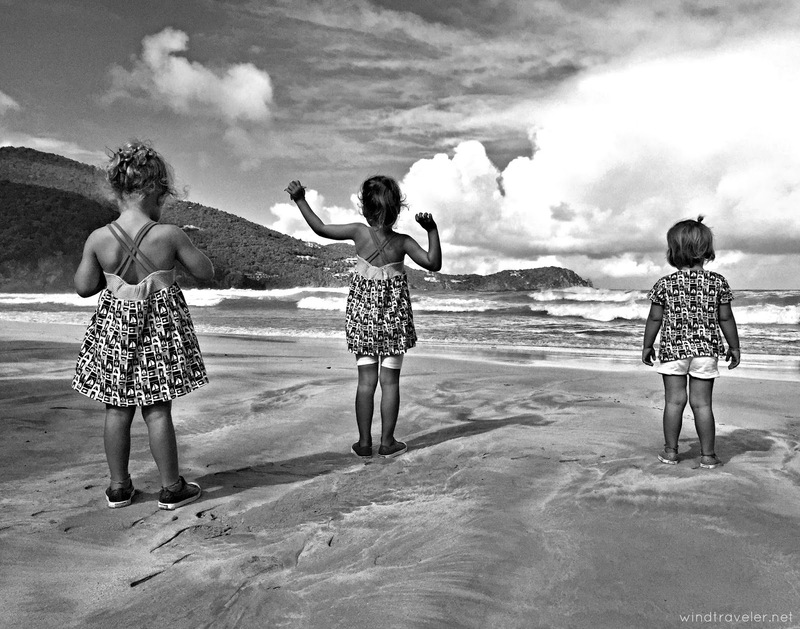 We drove on further along the coastline, a couple waves crashing onto my car, up to the ridge road, where we continued our tour around hair-pin turns, up steep climbs and down swift slopes...we drove and drove, stopping to take pics, to tell the girls to take it in, to revel in the immense beauty of our adopted island, Tortola. The waves were roaring, powerful and magnificent from every angle. With every crash they screamed the sheer energy the ocean beholds. She can be calm, but she can be fierce. She is a force to be reckoned with. Our final destination was in East End, in Josiah's bay. We were hoping to see surfers on the water but they weren't out this morning. The waves - we were told by some female surfers on a yoga/surf retreat that we'd just met - we're "too gnarly" in the bays we visited. Something about the period between them and the direction of the wind. We settled down at the beach, watching quietly and decided to get some snacks at Naomi's Place, a little snack shack right there on the beach. 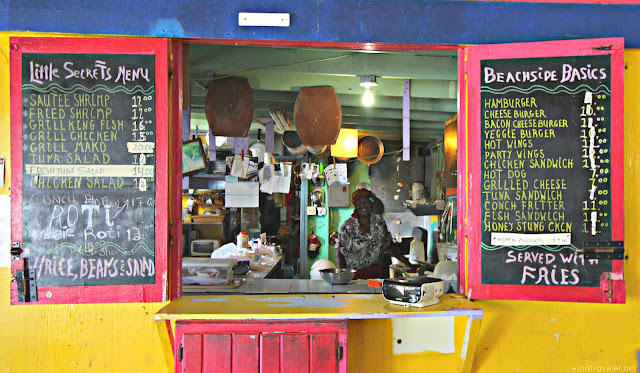 If there is one thing that is quintessentially Caribbean to me, it is the local eatery run by a beautiful West Indian mama cooking her heart out. Naomi did not disappoint...her restaurant, a handful of tables with shell chimes dangling from every window, is as picturesque as can be. The kitchen is open and would pass no FDA test in the US, but it doesn't matter. It feels more like you are in her home than in a restaurant, and patience is the name of the game. Pots, pans and cooking utensils are everywhere and there is order in the disarray. Naomi, with her gentle demeanor and warm smile makes it that much lovelier. 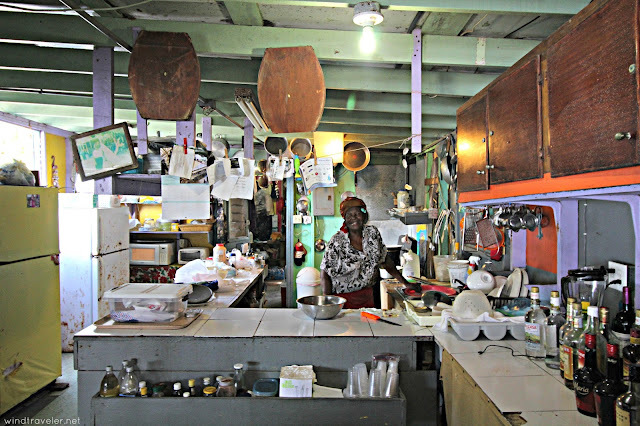 She shuffles around in the kitchen, tending casually to bubbling pots and spitting frying pans, her timing as natural and effortless as that of the waves to the shore. 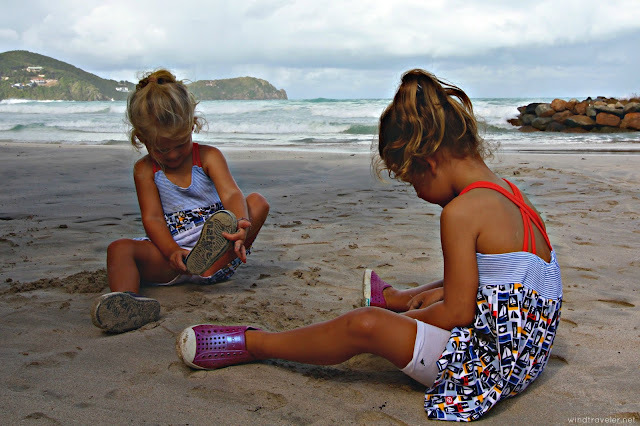 As we waited for our food, the girls checked out Naomi's shell collection and played barefoot in the sand outside her place, we brought no toys and they were perfectly content to explore and play using their minds. The tingling of shell chimes blowing in the wind combined with the dull roar of crashing waves and the tinny background drone of Naomi's alarm clock radio set the scene. I looked around, surrounded by people I love, and felt a humongous wave of gratitude wash over me. 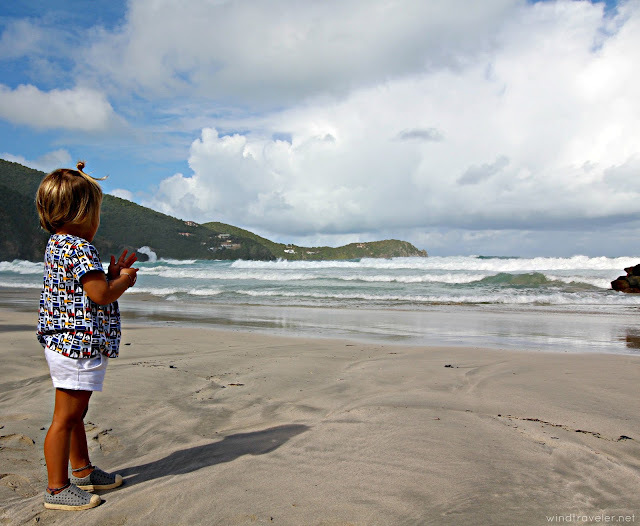 What began as a little spontaneous island adventure had shaken my senses, awakened my creativity and reminded me all that I love about island life. And my God, do I love island life. For all the challenges and struggles it presents, the beauty it brings forth - for me, my family - is worth it all. Like the waves crashing into the shore, there is magnificence in the chaos. Thank you for your words and taking the time to share them. They inspire me to seek out my own piece of heaven! It's so nice to see your name pop up in the comments of one of my favorite blogs (that YOU introduced me to!). SO looking forward to catching up with you and Denis on our charter! I've been a fan for years, and I usually get your emails. I would like to ask a question, these prices for the sandwiches that are on the plate are in US dollars.? Yes, US $$$... not cheap I'm afraid!!!!! Totally not digging the North swell right now, agreed! We have been sailing to shows in it and just getting ready to sail out of Anguilla today. At least it is downwind to Marigot, Saint Maarten from here and REALLY close. Whew. The beach. The ocean. The sky. Natural beauty. That's how I find my peace in this world. And gratitude. GRATITUDE....at the beach, I feel in in all caps! Ahhhhhh. We live on the Connecticut shore...just got back from a Florida family vacation. My husband calls me his saltwater bride. You understand why.